Home / Deals / Online Deals / Small Kitchen Appliances on Sale for $2.44! 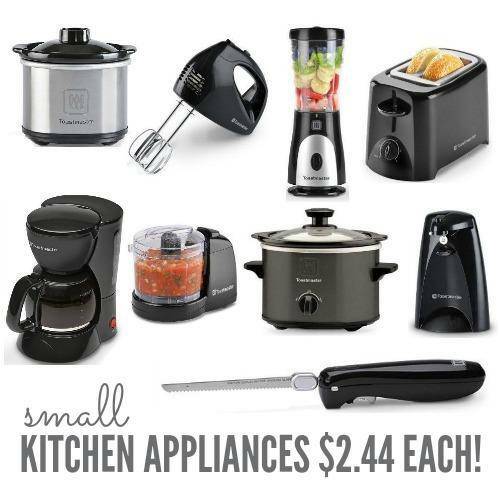 Now through 10/2/16 Kohl’s is having a great Small Kitchen Appliances on Sale for $2.44! We have new Kohl’s Coupons you can stack with the new $12 Rebates to get cheap appliances! The Toastmaster brand Small Kitchen Appliances are on sale for $16.99 each plus if you sign up to get Kohl’s Text Alerts, text SAVE24 to 56457, you can use the code SMS1871 to save an additional 15% off your purchase. Even better there are $12 Mail In Rebates for these appliances bringing your cost down to just $2.44 each! Right now you can also get $10 Kohl’s Cash for Every $50 spent if you really want to stock up! Toastmaster Slow Cooker 1.5 qt. Each one of these appliances is priced at $16.99 and you can get $12 Mail In Rebates on all of them, making them $6.99 after the rebate and then you can use the code SMS1871 at checkout to get 15% off! That means you will pay $2.44 each after the rebate and code. Don’t miss the great deal on The Big One Throws for only $8.49! Tommy Hilfiger All American Bath Towels only $4.24 at Macy’s!